The imagination of the online photographic community has recently been sparked by so-called cinemagraphs: short, seamlessly looping animated GIF images created from video in which only parts of the image move. These cinemagraphs capture the dynamics of one particular region in an image for dramatic effect, and provide the creator with control over what part of a moment to capture. 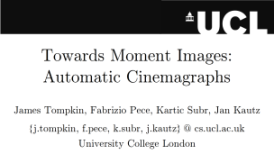 We create a cinemagraphs authoring tool combining video motion stabilisation, segmentation, interactive motion selection, motion loop detection and selection, and cinemagraph rendering. Our work pushes toward the easy and versatile creation of moments that cannot be represented with still imagery. Click to download - video playback software often introduces gaps or stutters when in 'loop' mode!